Using NASA's Chandra X-ray Observatory, scientists have detected X-rays from a low mass brown dwarf in a multiple star system, which is as young as 12 million years old. This discovery is an important piece in an increasingly complex picture of how brown dwarfs -- and perhaps the very massive planets around other stars -- evolve. A Chandra observation revealed X-rays produced by TWA 5B, a brown dwarf orbiting a young binary star system known as TWA 5A. The star system is 180 light years from the Earth and a member of a group of about a dozen young stars in the constellation Hydra. The brown dwarf orbits the binary star system at a distance about 2.75 times that of Pluto's orbit around the Sun. Credit: NASA/CXC/Chuo U./Y.Tsuboi et al. Chandra's observations of the brown dwarf, known as TWA 5B, clearly resolve it from a pair of Sun-like stars known as TWA 5A. The system is about 180 light years from the Sun and a member of a group of about a dozen young stars in the southern constellation Hydra. The brown dwarf orbits the binary stars at a distance about 2.75 times that of Pluto. This is the first time that a brown dwarf this close to its parent star(s) has beenresolved in X-rays. "Our Chandra data show that the X-rays originate from the brown dwarf's coronal plasma which is some 3 million degrees Celsius," said Yohko Tsuboi of Chuo University in Tokyo and lead author of the April 10th issue of Astrophysical Journal Letters paper describing these results. "The brown dwarf is sufficiently far from the primary stars that the reflection of X-rays is unimportant, so the X-rays must come the brown dwarf itself." TWA 5B is estimated to be only between 15 and 40 times the mass of Jupiter, making it one of the least massive brown dwarfs known. Its mass is rather near the currently accepted boundary (about 12 Jupiter masses) between planets and brown dwarfs. Therefore, these results may also have implications for very massive planets, including those that have been discovered as extrasolar planets in recent years. "This brown dwarf is as bright as the Sun today in X-ray light, while it is fifty times less massive than the Sun," said Tsuboi. "This observation, thus, raises the possibility that even massive planets might emit X-rays by themselves during their youth!" This research on TWA 5B also provides a link between an active X-ray state in young brown dwarfs (about 1 million years old) and a later, quieter period of brown dwarfs when they reach ages of 500 million to a billion years. Brown dwarfs are often referred to as "failed stars," as they are believed to be under the mass limit (about 80 Jupiter masses) needed to spark the nuclear fusion of hydrogen to helium, which characterizes traditional stars. Scientists hope to better understand the evolution of magnetic activity in brown dwarfs through the X-ray behavior. 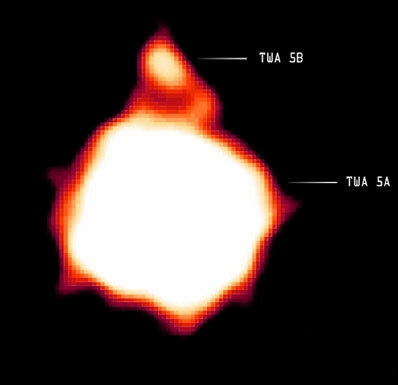 Chandra observed TWA 5B for about three hours on April 15, 2001, with its Advanced CCD Imaging Spectrometer (ACIS). Along with Chandra's mirrors, ACIS can achieve the angular resolution of a half arc second. "This brown dwarf is about 200 times dimmer than the primary and located just two arcseconds away," said Gordon Garmire of Penn State University who led the ACIS team. "It's quite an achievement that Chandra was able to resolve it." Other members of the research team included Yoshitomo Maeda (Institute of Space and Astronautical Science, Kanagawa, Japan), Eric Feigelson, Gordon Garmire, George Chartas, and Koji Mori (Penn State University), and Steve Prado (Jet Propulsion Laboratory). NASA's Marshall Space Flight Center in Huntsville, Ala., manages the Chandra program, and TRW, Inc., Redondo Beach, Calif., is the prime contractor for the spacecraft. The Smithsonian's Chandra X-ray Center controls science and flight operations from Cambridge, Mass., for the Office of Space Science at NASA Headquarters, Washington.